Seven generations of the von Schlegel family of Germany beginning with Ernst von Schlegel, Surveyor of Mines in Saxony, are well-documented in "The Schlegel Von Gottleben Family in Germany" down to Christoph Friederich von Schlegel who immigrated to Pennsylvania in the early eighteenth century. Christoph von Schlegel was the father of Mary Magdalena von Schlegel the wife of Henry Bedinger. She was descended from a line of ennobled, well-educated, and distinguished professional clergymen, university professors, diplomats, poets, barristers, soldiers and ministers of state. Her cousins were the famed romanticist philosophers and poets, the brothers August Willhelm and Friederich von Schlegel. Of all the professions in which the von Schlegels were engaged, their service to the Lutheran church stands out prominently. 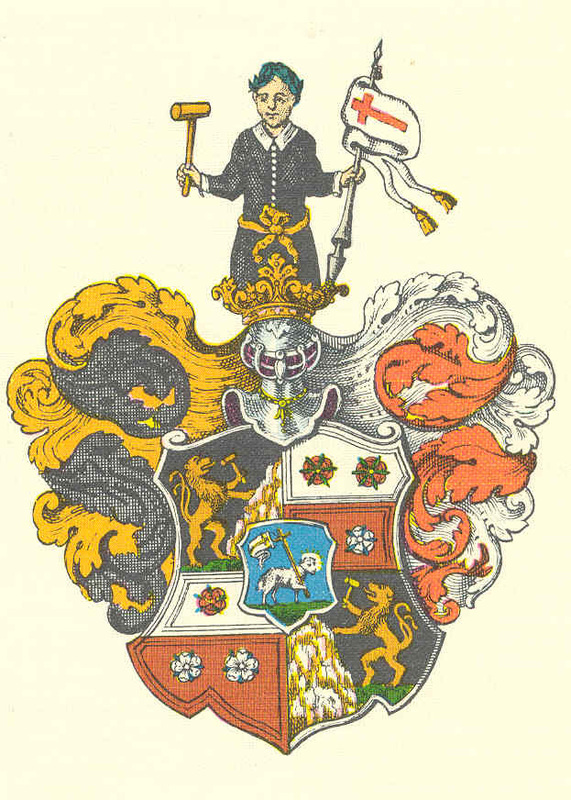 The fitting predicate, “von Gottleben”, meaning “a godly life”, was bestowed to the family patent of nobility in 1651. The genealogy of the von Schlegel family in Germany was compiled by Karl Friederich von Frank and translated from German by George A. Bingley and William B. Marye. In addition to the ancestral line of von Schlegel, the genealogists have made note of the common ancestry of the family von Schlegel with noted men of Germany, including the poet, scientist and philosopher Johann Wolfgang von Goethe, the pianist Hans von Bulow, the General Field Marshall von Bulow, the aviator Baron Manfred von Richtofen, a.k.a. the Red Baron, the mathematician August Ferd Mobius, the painter Ferdinand von Rayski, the minister of state Christoph von Kitsch, the minister of state Johan Christian von Wollner, the painter Lucas Cranach, and General Friederich von Katzeler. Mary Magdalene's father, Christoph von Schlegel (d. ca 1772), emigrated from Germany in 1703; he settled at New Castle, Delaware and later removed to Philadelphia Co., Pennsylvania and finally settled on Slagles Run, a branch of the little Conewago, in 1737. Maria Magdalena von Schlelgel “... was a woman of intelligence and good education for those times is clear." wrote Helen B. Pendleton in her sketch of the Bedinger. She had seen a letter Mary Magdalena wrote to her son George Michael Bedinger in Kentucky, dated ‘Shepherds Town, August 4, 1796. "It is in excellent English, the handwriting exquisitely fine, almost as if it were engraved." 1. Mary Magdalena von Schlegel was the daughter of 2. Christoph Friedrich von Schlegel and 3. Anna Maria Aistrin. She married (1) Henry Bedinger 1752 in Pennsylvania. He was born 1730 in Europe, and died 22 Jan 1772 in Shepherdstown, West Virginia1. He was the son of Hans Adam Bietinger and Anna Margarethe Schusch. 2. Christoph Friedrich von Schlegel, born 24 Oct 1676 in Saxony, Germany; died 1772 in York Co., PA. He was the son of 4. Christoph Gottlieb von Schlegel and 5. Dorothea Christina Hertel. He married 3. Anna Maria Aistrin (Aister6) 15 May 1718 in Hanover, York Co., PA.
3. Anna Maria Aistrin, born 1680 in York Co., PA; died 1779 in York Co, PA.
1i. Mary Magdalena von Schlegel, died 1797 in Shepherdstown, West Virginia; married Henry Bedinger 1752 in Pennsylvania. 4. Christoph Gottlieb von Schlegel7, born 30 May 1640 in Breslau, Germany; died 19 Jun 1697 in Grimma, Germany. He was the son of 8. Christoph von Schlegel and 9. Magdalena Tilisch. He married 5. Dorothea Christina Hertel 15 Nov 1675 in Grimma, Germany. 5. Dorothea Christina Hertel8, born 11 Sep 1654 in Grimma, Germany; died Aft. 09 May 1698 in Grimma, Germany. She was the daughter of 10. Christian Friedrich Hertel and 11. Dorothea Thiele. ii. Magdalena Dorothea von Schlegel, born 02 May 1678 in Grimma, Germany; died 22 Dec 1743 in Grimma, Germany. iii. Johann Gottleib von Schlegel, born 03 Nov 1680 in Grimma, Germany. iv. Gottfried von Schlegel, born 23 Oct 1683 in Grimma, Germany. v. Christian Reinhard von Schlegel, born 11 Dec 1688 in Grimma, Germany. Schlegel and 17. Maria Faber. He married 9. Magdalena Tilisch 02 Sep 1639 in Breslau, Saxony, Germany. 9. Magdalena Tilisch, born 09 Nov 1621 in Breslau, Saxony, Germany8; died 28 Jan 1645/46 in Breslau. ii. Magdalena Dorothea von Schlegel, born 10 Dec 1641 in Breslau, Germany; died 05 Jul 1642 in Breslau, Germany. iii. Christian von Schlegel, born 10 Jan 1642/43 in Breslau, Germany. iv. Maria Dorothea von Schlegel, born 23 Jun 1644 in Breslau, Germany; died 06 Jan 1705/06 in Dresden, Saxony, Germany. v. infant daughter von Schlegel, born 01 Jan 1645/46; died 01 Jan 1645/46. 10. Christian Friedrich Hertel, died 16 Feb 1680/81 in Grimma, Germany. He married 11. Dorothea Thiele 02 Sep 1650 in Grimma. 11. Dorothea Thiele10, died 29 Dec 1679 in Grimma, Germany. 5 I. Dorothea Christina Hertel, born 11 Sep 1654 in Grimma, Germany; died Aft. 09 May 1698 in Grimma, Germany; married Christoph Gottlieb von Schlegel 15 Nov 1675 in Grimma, Germany. married 17. Maria Faber 1606. 17. Maria Faber, born 30 Oct 1586 in Plossig; died 06 Oct 1676. 8 i. Christoph von Schlegel, born 01 Jan 1612/13 in Kmehlen, Germany; died 02 Jul 1678 in Grimma, Saxony, Germany; married (1) Rosina Gloger Von Schwanbach; married (2) Magdalena Tilisch 02 Sep 1639 in Breslau, Saxony, Germany. ii. Christian von Schlegel, born 1610; died 1644.
iii. Gottfried von Schlegel, born 10 Nov 1611 in Weissensee, Thuringia; died 18 Nov 1636 in Marlishausen. iv. Dorothea von Schlegel, died 24 Mar 1665/66. vii. Johann Gottleib von Schlegel, born 1619 in Dresden (? ); died 1642.
viii. Martin von Schlegel, born 1622 in Dresden. 32. Paul von Schlegel, died Bef. 1610. He was the son of 64. Ernst von Schlegel and 65. Sybilla Hopner. 16 I. Martin von Schlegel, born 1581 in Dippoldiswalde, Saxony; died 04 Aug 1640 in Weissensee; married Maria Faber 1606. 64. Ernst von Schlegel He married 65. Sybilla Hopner. 65. Sybilla Hopner She was the daughter of 130. Matthaus Hopner and 131. Sybilla Lodich. Dandridge, Danske, "Henry Bedinger and Old Shepherdstown", draft manuscript, box 35, Bedinger and Dandridge Collection, David M. Rubenstein Rare Book & Manuscript Library, Duke University, Durham, North Carolina. Frank, Karl Friedrich Von, 1967, The Schlegel Von Gottleben Family in Germany, Transl. by George A. Bingley and William B. Marye, A. Russell Slagle, Baltimore, Maryland, 391 p.
Abridged Compendium of American Genealogy. Irvin H. Tweedy, Sr., va_tweedy, Rootsweb file of Irvin H. Tweedy, Sr., Irvin_Tweedy@prodigy.net, "Electronic."